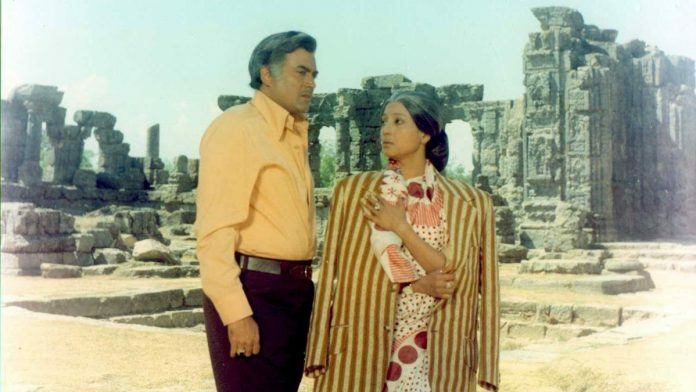 Suchitra Sen and Sanjeev Kumar-starrer Aandhi was banned by Indira Gandhi govt during the Emergency. The issue of censorship is back in public debate with the news of Netflix’s self-regulation. The Indian government continues to assert itself from time to time as the gatekeeper of content — political or pornographic. One of the greatest examples of this censorship — especially as 2019 elections near— remains Gulzar’s 1975 political film Aandhi. Aandhi, starring Suchitra Sen as protagonist Aarti Devi, was released the same year as the Emergency and looked uncannily like a portrayal of then Prime Minister Indira Gandhi’s life. So much so, that certain posters doing the rounds said: “See your Prime Minister on screen”. After 20 weeks in the theatres, Aandhi was banned. It would return to the cinema halls only after the Janata Party came to power in 1977 and after Gulzar omitted some of the scenes showing Aarti Devi drinking and smoking. Aandhi was Suchitra Sen’s last Hindi film, and one of her most acclaimed roles. Starring with her was then Bollywood heartthrob Sanjeev Kumar as her estranged husband. The film starts off with opposition leader Chandrasen (played by Om Shivpuri) addressing a large gathering. He confidently booms through the microphone, warning the public that Aarti Devi is campaigning only for votes and has no intention of real development. The scene cuts to a khadi saree, sunglass-wearing Aarti Devi. In a closed meeting, she takes stock of the situation with her campaign strategists. Nehru cap and coat-wearing politicians explain to her that each of her oppositions have either the labour community or the business community under their wings. True to Gulzar’s filming style, the movie plays out over many flashbacks. The first 30 minutes of the film critically establishes the parties at work. Media manipulation sees its best depiction on screen in this film with Chandrasen confronting an editor of a newspaper. He cunningly says, “Election se pehle aap humara dhyan rakhiye aur uske baad hum apka”. While campaigning, coincidentally, Aarti Devi ends up in a hotel whose manager is her estranged husband, J.K. (Sanjeev Kumar). A few emotional meet-ups and several flashbacks later we learn how the two came together, got married, gave birth to a child and then separated. As the two get intimate after nine years, their clandestine meetings get photographed and published on the front page, sorely damaging Aarti’s reputation. But hidden in this cacophony of emotions lies the story of a woman out to make her position in a male-dominated world. Her career and ambitions come first, love can wait. The film also tells us that life for Aarti Devi was not always like that. In a reference to the relationship between Jawaharlal Nehru and Indira Gandhi, a young love-smitten Aarti tells her rich businessman father she wants to get married. He is not angered at her choice of marrying a hotel manager but at her getting married altogether. He asks her to go beyond the general practices of getting married and giving birth, saying, “Aage kya, future ka kya hoga?” He even says her education was wasted because she has chosen to settle down. A scene before its time some might say. The movie then moves on to a day before the election when Chandrasen is publicly taking personal digs at Aarti Devi till she herself arrives before the audience to set things straight. She tells the crowd that the man she was photographed with was her husband and she had to let go of him and their child so that she could religiously serve the public. Emotionally touched voters naturally vote her back to power despite her wish to leave the world of politics. She eventually flies off in a helicopter as her husband looks on. Aandhi features two of Bollywood’s evergreen songs composed by R.D. Burman, Tum Aa Gaye Ho Noor Aa Gaya and Tere Bina Zindagi Se. Both the eternal romantic songs were sung by Lata Mangeshkar and Kishore Kumar. Gulzar’s crafty lyrics pack in political mockery in the song Salam Kijiye, which criticises politicians who only visit people every five years just before the elections. 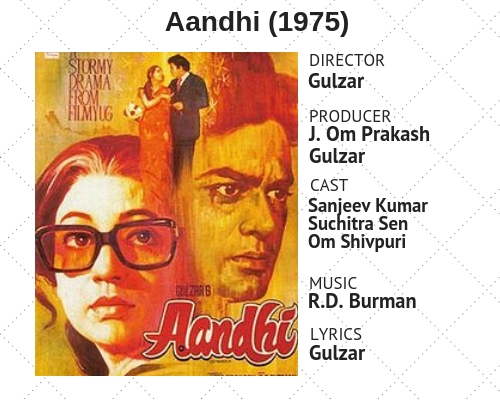 Aandhi sees Gulzar make a political commentary with the support of a romantic plot, an unlikely combo. He manages to bring out a modern-day ‘Bharat Mata’ through Aarti’s character — one who sacrifices her family life to serve the public while following Gandhi’s rulebook. Female politicians have been cast in different hues by Bollywood. In recent times, female politicians have been portrayed in a negative light — from Supriya Pathak in Dibakar Banerjee’s Shanghai to Shabana Azmi in Vishal Bhardwaj’s Matru Ki Bijlee Ka Mandola. Gulzar’s Aarti Devi stands out— she has a spine, morals and a clear vision of what she wants. As the bugles of 2019 elections are blown, it’s time to revisit Aandhi.